So I bought this 85 200x. It's my first project and I'm fairly new to fixing stuff. So my question is : do I need a Reed valve for this 200x, if so where does it belong ? A simple search would tell you a reed valve is for a two stroke motor . Reed valves are for 2 strokes. Four stroke engine utilize a Kanuter Valve. It controls oil flow to the muffler bearings. Also make sure your power band is not stretched out!!! I have some of those for sale! Only 1st through 4th gears though. I'm keeping all the 5th gear powerbands for myself. Back to reality and all seriousness. Where did you manage to order an OEM carburetor? All I find is OEM Quality which is Mandarin for "Stupid American's just keep buying this stuff thinking MAYBE next time it will actually work." Actually, oddly enough, there has been a few instances over the years where people have put reed valves on 4 stroke engines, and I was aware of one of those attempts when I worked at Norm Reeves Motorcycles in the mid 70's. "All sorts of interesting custom bikes and engine projects are coming out of Sweden all of a sudden, or at least, I'm just coming across them, and John Ellwood thought we might like to see one more, it's his Ellwood Hybrid, a single cylinder, 4 stroke with reed valves, from a 2 stroke, mounted on the crankcase directing the crankcase pressure to charge the intake twice per power stoke. The exhaust stroke pumps the intake once and the reed valve holds the charge, the intake stroke pumps it the second time when it goes into the cylinder, so you have a 2 stroke like pumping action from under the piston and a 4 stroke firing cycle. John Ellwood, who built this engine, says hybrid engines working on this principle began back in 1915." 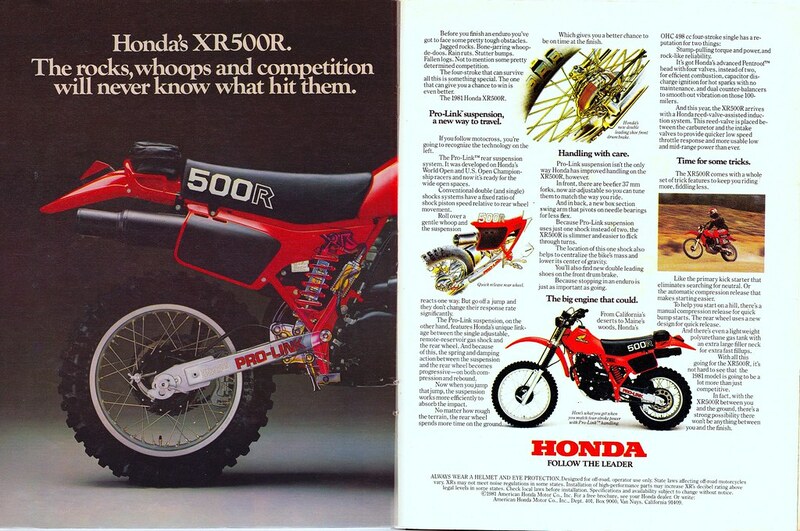 And for the pièce de résistance, your guys much beloved HONDA Motorcycle Company even built a production reed valve 4 stroke in 1981 and 1982 called the XR500, but apparently that's something that only a KAWASAKI guy would know. "And this year the XR500R arrives with a Honda reed-valve assisted induction system." You can steer a car with your feet too but that don't make it a good idea. Well one size does not fit all, and Shindaiwa seemed to think it was a good enough idea to put one on their current engines for their particular app, and obviously Honda thought the same thing in 1981/1982 for their particular app. Obviously it is unusual and not the norm, but the fact remains that it has been done, and currently is being done. That is true. I'm sure the Wankel, Sleeve Valve & Opposed piston engines seemed like a good idea at the time too. Well, the Wankel engine, is definitely not a "bad" idea at all, and just because Mazda had issues with it, it does not mean the idea is inherently bad. In the case of the Mazda rotary engine, it was the execution/design and substandard parts they used that caused most of the issues. If China made a copy of a Toyota, I'm quite confident that the original Japanese made one would last far longer with far fewer problems. Mazda, is even remaking the rotary engine and is going to use it in some of their new models. Here's a lame ol' rotary race car that did the 1/4 mile in 6.7 seconds at 206 mph while spanking a dragster with a V8 engine in it. Here's a newer video of that poor ol' rotary car doing the 1/4 in 6.2 at 223 mph on the weekend it want it's class in one of Australia's biggest drag racing events, and that run was faster than most NHRA Pro Stock cars run in the US. General Pro Stock Engine info. Pro Stock engines use electronic fuel injection and spec gasoline and are restricted to a maximum of 500 cubic inches. They can make in excess of 1,300 horsepower. A competitive Pro Stock car can run in the 6.5s at more than 210 mph. I added some pictures of what I got, any advice you guys may have for restoring this awesome machine.